It's time to get your outdoor tubs started! 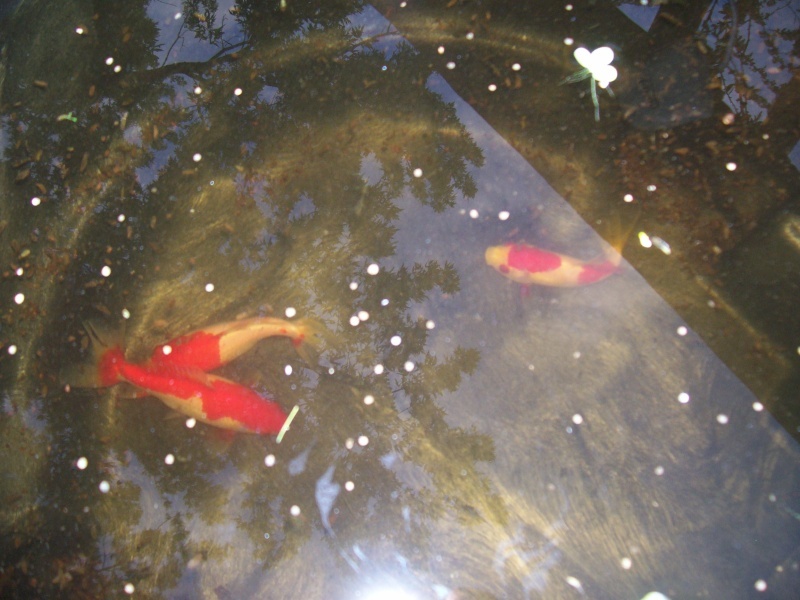 I always put the goldfish and rosy barbs out about now, they can handle nighttime temps of 50 degrees. I also throw out my water lettuce and duckweed. It's also a good time to age the water in the tubs for the warmer tropicals like swordtails and guppies. I don't put those out till the end of May. I'll bring some water lettuce starts to this months meeting. Just put them out for the summer but the temps dropped again. I'm sure they will be fine but maybe not the plants. With the upcoming lower overnight temps, are my outdoor fish in danger? I've got swords and platys in a 40g stock tank. I was running a heater and just added a 2nd. I think they were 40w ea. I guess I just want to know how low the water temps can get before the fish are in danger. This year has been cold for too long! If you have heaters, I'd say you are okay. Platies, Mollies, and swordtails originated from Central America and they can take a little cooler for short periods of time. I left my fish out and the plants are fine but I moved my tiny tiny goldfish fry back inside. It will warm up next week again. Well, my outdoor tubbin' isn't going as I'd planned. I had my 5 gallon tank outside with my new betta and Endlers in it for just a few hours in the afternoon after the last meeting. It got cold and I was worried, so I brought the tank in and set it on my kitchen counter because I didn't really have any place else to put it. Since then, I've been enjoying it so much there... that now I don't want to put it outside! I guess that solves my dilemma on where to put this 5 gallon tank. So even though my outdoor plan isn't going anywhere just yet, I'm glad it's gone the way it has. It gave me the push to get that tank up and running... and I happened on a place to put it, by accident, that I really like. I brought my swords in last night. When should I bring my goldfish in? Put some guppies, platy's, and swords in my 40gal stock tank today. I planted lilies last week and they've already started to take off. The forecast looks good. My tank had tons of mosquito larvae swimming around so there will be no shortage of food. I sure do enjoy a stock tank. Planted some lotus and a water lily. Maybe I'll add my fish soon. I'm a little behind this year. I put my goldfish in last night along with some lillys. I put some RED TAIL GOODEID in a 55 gallon tank, outside with no air. There seems to be some fry with several more RED TAIL GOODEID that are looking fat. These are young fish so I am not sure how many fry they will have. I also have another 55 with some yong tiger platies I hope that they will be able to reproduce in another month. I am off Monday so I may pull another tank from the garage and take it outside and put something in it. Am I pushing it? I put some guppies in a 20 gallon out door tank today? You might have to keep an eye on temps, usually the safe time is after Mother's day.